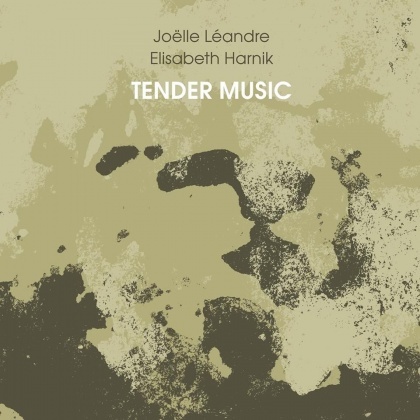 Bassist Joëlle Léandre and pianist Elisabeth Harnik have only been playing together since 2016 but this debut CD – a recording from their third ever performance – reveals a duo who have already developed a highly simpatico and sophisticated approach to spontaneous composition that draws equally on elements of free improvisation and contemporary classical music. Rather than the waxing and waning 40 minute set that presently constitutes a lot of live recordings, there is an adroit attention to form in operation here, as the duo present half a dozen perfectly shaped and finely delineated miniatures, ranging from six to 11 minutes long. For much of the time, Léandre favours a high, tightly controlled arco full of fragile harmonic overtones that often sounds more like a cello than a double bass. When Harnik responds with pellucid splashes and rippling hazes, the two are capable of creating sustained moods of gentle wonder and delicacy. Léandre adds an element of enigma with her slightly off-mic vocalising: somewhat absent-minded, more overheard than performed, it´s ephemeral, transitory and soothing in its wordless calm, evoking the private musings of a washerwoman at work or a nursing mother cooing her love. One almost feels compelled to lean in and strain the ears, searching for fleeting meaning in her mysterious mutterings. Many of the pieces are so balanced and sensitively executed that they possess a kind of inevitability. Call it perfection if you prefer. By contrast, the more abstract and experimental gambits gleefully ride a puckish unpredictability: the scritch-scratch of agitated piano strings and polystyrene squeak slotting into Léandre´s multiphonic gossamer arco textures; dirge-like dabs of unhurried bass with arachnoid scuttlings in the body of the piano. But, even at its furthest extent, this music emanates a warmth, a patience and, yes, as the title suggests, a tenderness that´s rarely heard. Harnik says that she has found her own intrinsic approach to the piano and with free improvisation through careful listening to French double bass master Joëlle Léandre, twenty years before she and Léandre began to play together as a duo. Tender Music, the debut album of this duo, captures their third performance on April 2016 in Graz, Austria. Harnik and Léandre continue to perform as a duo but even on this early phase of their collaboration they already established a profound bond. As Ken Vandermark notes in his liner notes, both bring to this setting their “unique personal creative histories – applying techniques and melodic/textual territories that are distinctly their own, developed in other ensembles and field of endeavors, and brought together through the parallel lines of expression”. Léandre likes to suggest her free-associative improvisations as spontaneous compositions and often she offers a set of programmatic improvisations, that offer different moods and dynamics. Harnik anchors these loose, compositional ideas in richer, coherent narratives. Léandre, on her side, knows how to play – literally – with Harnik thoughtful architecture of sounds and structured dynamics. She tempts her with her energy, passion and wicked sense of playfulness and humor. The six piece, all titled “Ear Area”, reflect this attentive, sometimes tender and delicate, but more often quite raging and restless, complementing interplay between these strong-minded improvisers. Léandre allows herself to be totally emotional and vulnerable on the second “Ear Area”, where she sings in an unusual, innocent voice. On later pieces, Léandre and Harnik sound as enjoying the common experience of heading into the unknown; the liberating sense of taking risks, searching for new, unknown terrains, dynamics and emotions. The last piece summarizes their distinct histories in a touching, tender way that suggests a unique a way of communication between the double bass and the piano, a personal, magical way that is totally their own and only they know its many secrets. Zwei Generationen selbstbewusster Improvisatorinnen, die das Gegenwartstreiben freier Improvisationsneigung in Bezug auf die nach wie vor maskuline Dominanz gehörig aufmischen und andererseits mit ihrer offenkundigen Eigenwilligkeit musikalische Relevanz betreiben. Die Rede ist von Joëlle Léandre, anerkannte Kontrabass-Koryphäe seit vier Jahrzenten und Elisabeth Harnik, auffallende Improvisationsgröße, die behände die Klaviatur der Fantasie bespielt, des hiesigen Zirkels der „ExtemporistInnen“. Sofort im Zentrum des Hörerlebnisses steht das engverkabelte Zusammenwirken in den Dialogen – genannt Ear Area -, die die beiden Musikerinnen seit einigen Jahren konsequent führen. Weiters, das feine Empfinden für Klang und die spezielle Fähigkeit aus dem Moment heraus Form mit Inhalt zu versehen. Technisch weisen sie fraglos jeden Makel von sich. Ansprechendes zu Hauf bietet ihr undogmatisches Herangehen an musikalische Funktionalismen und die primäre ad hoc-Leidenschaft. Es wird nicht die Frage gestellt ob die Töne nur um tonale Zentren kreisen, ob nur ein abstrakter Klangfarbenaspekt zählen soll. Sowohl das eine, wie das andere lassen die Musikerinnen bravourös passieren. Mit welcher Lust da harmonische Kleinode in Richtung von Regionen indeterminierter Klange strömen, Tremoli/Glissandi durch Obertonstrukturen flirren oder markante perkussive Pattern ihren Reigen tanzen. Darüber liegt ein Firnis menschlicher, emotionaler Tiefe. Zartheit in der Radikalität. Das cortische Organ auf Freiflug. From her base in Graz, pianist Elisabeth Harnik has spent the past few years enhancing her career as an improviser playing with sophisticated fellow Austrians as well as visitors, including Ken Vandermark and Alison Blunt. These recent CDs capture some of her most challenging work: Ways of My Hand is a mature demonstration of in-the-moment solo playing, while Tender Music exposes Harnik to the not-so-tender-mercies of French bassist Joëlle Léandre who has been furrowing the improvisational fields for years. On her own Harnik doesn’t shy away from listing her influences, dedicating a track each to singer Jeanne Lee and composer Conlon Nancarrow, and a four-part suite to composer/reedist Anthony Braxton. “As The Crow Flies North”, her Lee dedication, is an exercise in sustained languidness, extracting appropriate emotion from nearly-not-there string buzzing and juddering string preparations, concluding with suggestive soundboard echoes. Using an acoustic, unprepared instrument on “Every Time He Punched a Hole”, the Nancarrow tribute, Harnik approximates the cascading note billows he drew from a player piano, with key clusters encompassing thickened low pitches and clanking high ones, which crisscross one another. While suggesting a limitless flow of key note textures she also ends abruptly as if the perforated roll had run out. Befitting the honoree, “Flow and Construction” for Braxton, is more complex. Squirming and scampering the deepening sections evolve into crunches and complex high-frequency glissandi that are both recital ready and reflective. When tremolo chording divides into sharpened single notes, the case for appreciating the strummed piano-harp qualities of the instrument are made and completed with sharpened echoes. Displaying (Morton) Feldman-like chamber music resonations and multiple rhythms splashes, narrow textures band and are swept away with conclusive inevitability. As Léandre is constantly animated, there’s little stolid or narrow about the six improvisations which the pianist shares with the double bassist. Initially a bit hesitant as the bassist jumps, slides and stomps narrowed and staccato timbres – as well as vocalizing nonsense syllables – Harnik’s initial chamber-recital style accompaniment becomes more tilted, with key stop, making a connection with pinched inner strings and sul ponticello rubs on “Ear Area III”, finally rearranging into kinetic patterns. Although the extended conclusion the mates erhu-like piano-harp strums and bee-buzzing-like bow caprices into a florid and flow that’s both echoing and emotional, the climatic interface occurs with “Ear Area IV” and “Ear Area V”. Contrapuntal high-pitched piano glissandi and pounding, plus low-pitched string rubs scrubs from Léandre work their way into a shuffling romantic ending on the first. Subsequently, the sly melodic momentum is toughened with staccato scratches from the piano innards plus double bass thumping stops. The call-and-response formula confirms the duo’s intricate skill, ending with a conspicuous sweep of sparkling timbres. Succinctly the discs confirm Harnik’s talents in a solo setting and her ability to hold her own with one of the music’s most masterful improvisers. While French bassist Joëlle Léandre is among the most celebrated of improvising musicians, her duo partner here, pianist Elisabeth Harnik, isn’t as well known. She has, however, distinguished herself in her native Austria in groups like Barcode and Plasmic and has strong associations with notable Chicagoans: she’s recorded a brilliant trio session with Dave Rempis and Michael Zerang (Wistfully, Aerophonic) and plays in the DEK Trio with Ken Vandermark, who contributed liner notes to this CD. Harnik is a gifted improviser, combining technical resource and intuition in rare balance. propulsion, with a tonal abstraction allied to a sense of swing that suggests Jimmy Blanton and Duke Ellington trying to cheer up Anton Webern; a few minutes later there’s an abstract reverie in which the quietest upper register piano tones gradually emerge from bowed bass harmonics, the two then moving to full flight. whole moving in multiple directions at once. Each piece grows from individual impulses and gestures to become spontaneous collective composition—sometimes tender, sometimes witty, often both—and does so to a memorable degree.